(Before you roll your eyes like I do whenever anybody says “go organic”, please hear me out! )My first round of research disappointed me, I won’t lie. Organic is expensive, but you get what you pay for! And, is your skin worth it? Yes. I started to research organic face wash, and I came across several raving reviews on Amazon from Cancer patients, people with rosacea and severe acne for a brand called “Sukin”. 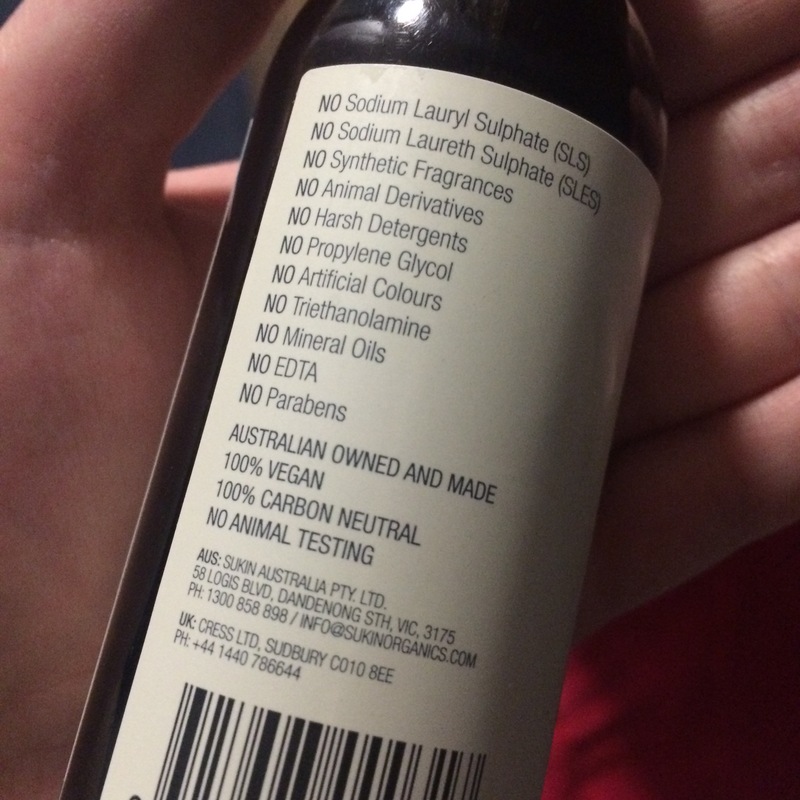 Sukin is an Australian brand: ‘Sukin, Australian Natural Skincare’ and they have a tagline saying “Skincare that doesn’t cost the earth” which is clever, because they didn’t cost me too much and it’s a carbon neutral product. For such little product this may seem excessive and usually I wouldn’t pay this much, but I’m desperate and there’s no harm in trying… Although, when I think about it, why exactly am I comfortable with paying £2-£5 per product which doesn’t do the job and has the same ingredients as the last lot of facial products I threw out, because they didn’t work? Yet I’m uncomfortable paying £27 (not including P+P) for three products collectively, that are said to work by people in similar health situations to me, and they have different ingredients that I have never tried before? I bought the above on Amazon, but FeelUnique.com also sell this brand. 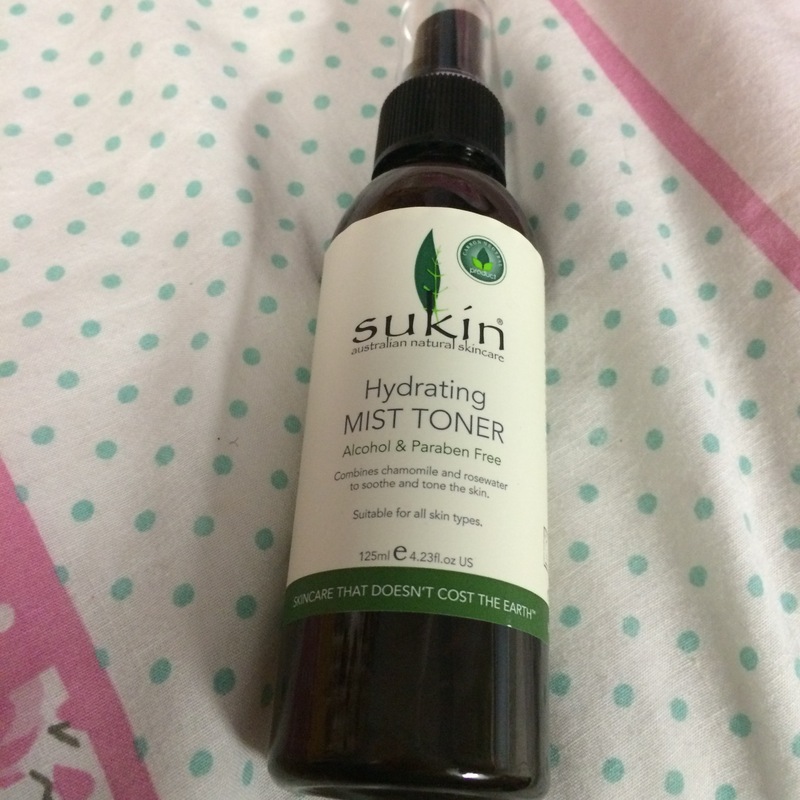 Here I will be writing about my experiences with the Sukin products. I’ll be honest, and will provide photos to show any changes (good or bad) to my skin while using this product. This way we see how long the bottles last with regular use, if the products are worth the money and what the results are on my face! It’ll be a weekly update diary until I run out and have to decide if I buy again, or try something else! 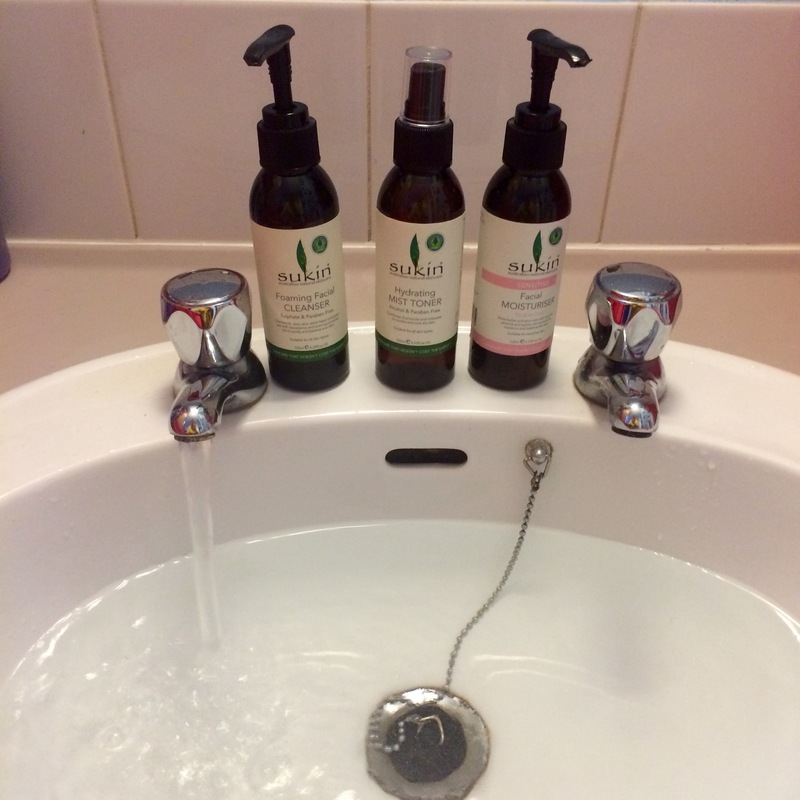 Friday 9th October: My Sukin skincare products arrived today, and I’m excited to try them. They recommend doing a patch test, so that is exactly what I’m going to do (after I’ve taken a spotty face photo first for the weekly before and after photos!) I patch tested a little area on my cheek to make sure my butterfly rash is not irritated by a reaction to the ingredients. To patch test I used a small amount on one area of my cheek and did the routine as I would normally. An hour later: so far so good, in fact I seem to think that the moisturiser test patch on my cheek actually looks less red but I suspect that may just be make believe because I want to have found my forever skin product. I’ll leave it for the evening, and go to sleep and we’ll see then. 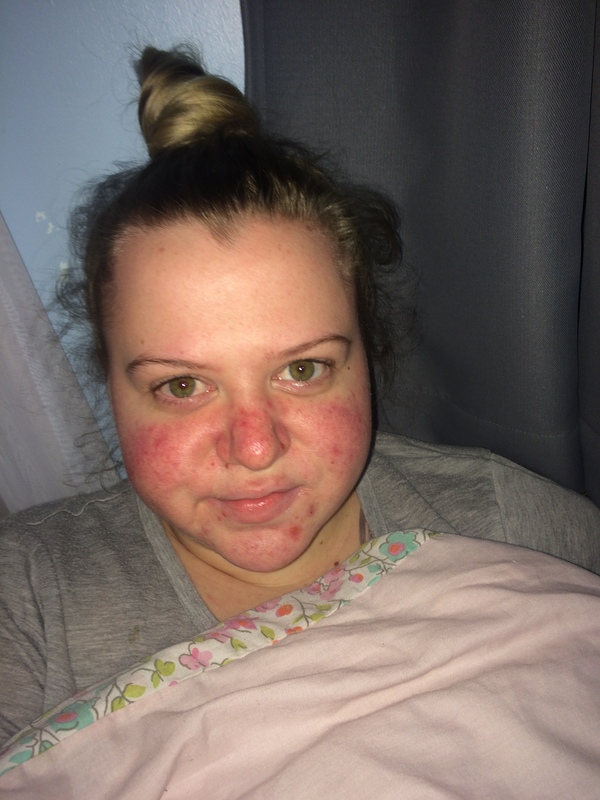 Photo below was taken on Friday 9th October 2015, before the patch test. This is my “natural” skin. Starting skin day before skincare routine. Getting ready to start the experiment! Saturday 10th October: Today is the day I start trying my new facial routine! The patch test showed no reaction, I’m ready for this experiment! I washed my face this morning before work, the Facial Cleanser is really foamy with just one pump, it seems to go really far for how little you use and has a lovely herbal scent to it! Even after just washing the product off my face, my skin has a clean feeling that I haven’t always experienced with face wash.
I’ve patted my face dry with my towel, now to use the Hydrating Mist Toner to close my giant pores. Again, a lovely herbal and natural scent, and the spray felt like it was working, by that I mean it was giving me tingles on my face as if my pores were popping closed, one by one, to keep the nasty dirt out of them. Now to let that dry fully while I do my hair for work. Facial Moisturiser time! The moisturiser feels so silky, which has me worried that my skin is going to turn out oily with it, but my skin doesn’t feel tacky like with standard moisturiser, it feels as if this stuff is being absorbed quickly by my skin so I’m not having to wait an hour before I put anything on my face. If I put this on in an evening before bed I’m not likely to be waiting hours before I can pass out on my pillow! So far so good, I’ll update later today! Evening results! I’ve just finished work, it’s 9pm, my skin still feels clean and my spots seem to have reduced thanks to the cleanser and my face and neck still feel hydrated and smooth from the moisturiser, my pores look smaller as if the toner has tightened them up too! So first impressions are great! I’m going to start my evening routine with a TV show, pyjamas, a cup of tea then my face routine and off to bed. I’ll let you know how things are looking next Saturday! Sunday 18th October: It’s been a week of skin cleanliness! So far I have no complaints about Sukin, if anything I have nothing but praise. I’ve tried to avoid wearing makeup all week so I could give my pores a break and allow the skin to feel the effects of my new skincare routine. I’ve done this routine every single morning and evening this week, apart from this morning (Sunday 18th October) and I have regrets about not washing my face. My skin with Sukin is typically very soft and dry skin free. Today because I forgot to wash my face (ok, I didn’t wake up until the afternoon…) my skin is very dry. Sukin seems to keep my skin feeling soft all day and night and hydrated so I’m not left worrying about dry skin drama which is definitely a bonus. I’ve asked friends for their honest feedback about how my skin is looking after only one week, and one thing they all say is that my skin looks less red. Yes, I have achieved something I never thought I could. My Lupus butterfly rash is looking less red. I have no idea why my skin looks less red, but I’m going to assume that my skin isn’t being irritated by chemicals when I wash my face, rather it is being soothed by the sensitive natural products that Sukin use. The only issue on my skin right now, is that the under skin spots have been brought to the surface, but they’re slowly fading. And, finally, my skin is a lot smoother than usual, no blotches or bumpy skin! Wednesday 18th November: Last week it rained, I mean, I was ready to swim. Umbrellas were breaking, hair was curling. It was not a happy time. You’re probably confused about my weather talk but the rain plays a big part in this part of my review! I know it’s been a long time since my last blog post, but I thought it was best to continue the Sukin products without checking my skin obsessively every time I washed my face so that I would notice a more reportable difference. So this morning (the morning with the crazy rain) I washed my face, as usual and walked to the bus stop. While waiting for the bus (broken umbrella so I’m getting soaked at this point) I felt like I had slime on my face (gross). I wiped my face with the back of my hand to see a gloopy slimy residue (don’t…) I had put my moisturiser on an hour before I went out in the rain, which gave plenty of time for it to dry/sink into my face. I kept getting soppy moisturiser goop in my eyes, it was honestly the most vile feeling ever. Saying all of the above, I am in LOVE with this moisturiser. It makes my skin so soft, without the risk of acne outbreaks as it is not greasy like cheap facial moisturiser. Happy December! This is my final verdict on Sukin products, I’ve finally run out of Cleanser and Toner with plenty of moisturiser left. Sukin’s products (Toner and Cleanser) lasted me a total of 58 days. Which is an average amount of time that I would normally run out of my cheaper products. Sukin lasted me just short of two months which includes two washes a day (morning and evening). I still have plenty of moisturiser left, a tiny bit goes a long way. I’m not impressed with the Foaming Facial Cleanser. I personally feel like I paid a lot of money for what I can achieve with a cheap synthetic facial wash, which defeats the object of me trying organic. I know I’ve ranted and raved about how much I loved this stuff at first, but my mind has changed. It’s like my skin got used to the cleanser, I started to break out really bad and I’ve not changed anything about my life that I wasn’t already doing before. This cleanser unfortunately was not for me, which is disappointing because I really wanted to love it, and I really loved it during my first impressions. My friends and flatmates noticed a change when I initially started using these products, my skin was clearing up. Now my friends and flatmates have started to ask me if I’m still using the products because my skin is getting really bad again. I played a little experiment on myself, I used the cleanser and broke out. I stopped using the cleanser and my issue areas and spots reduced. So I’m disappointed. I’m slightly impressed with the Toner, I’ve never used a toner in a spray bottle before and I really loved that about it. It definitely tightened my pores up again, I could feel it working but it didn’t blow me away and I’ve used cheaper toners that do the same job. It also claims to be a “hydrating” toner, but I got quite the opposite reaction on my skin, it dried out my skin and made it flaky before I put on my moisturiser. Another issue is that to cover the surface area of your face you need to spray it a lot, which means the product gets used up a little quicker than the cleanser, which is not a massive issue but still a point I thought I’d add. 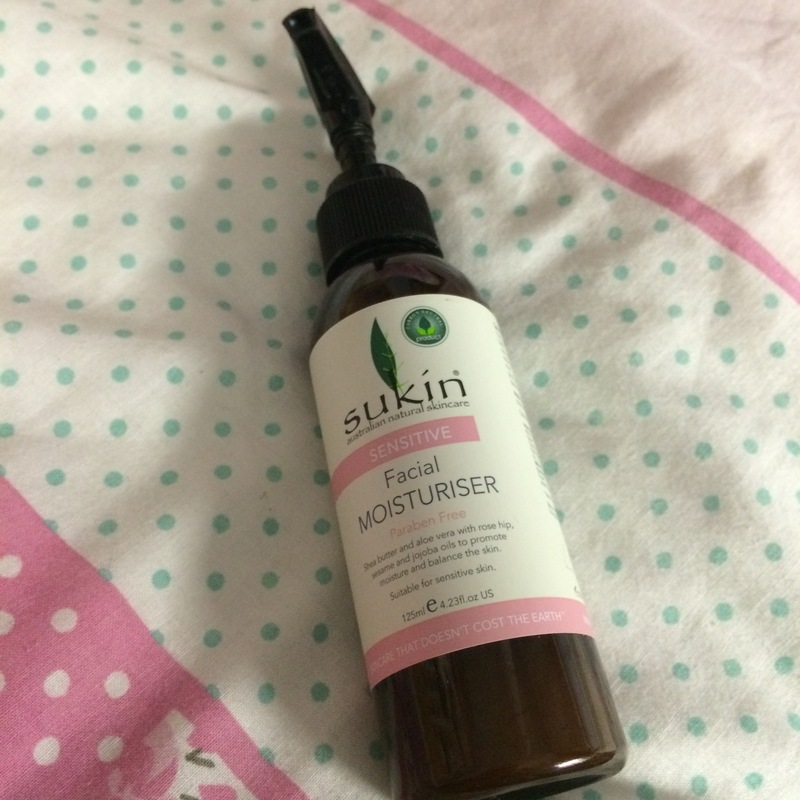 I love the Sukin Sensitive Moisturiser and would definitely continue buying it, I just have to watch out for the rain! My skin is so soft and smooth with this product. It is a non-greasy moisturiser and lasts forever because a small amount goes such a long way. One pump is usually enough to cover my neck and whole face. It’s such a light and gentle feeling when you put it on the skin and it is one of the very few moisturisers I’ve tried on my butterfly rash where it does not irritate it. LOVE! All that being said I would rate these products collectively 3 butterflies out of 5.